Background Bilateral C5 motor palsy is a rare but potentially debilitating complication after cervical spine decompression with very few reports in the published literature. Purpose To present a case of bilateral C5 motor palsy after anterior cervical decompression and fusion and discuss the incidence and risk factors of this complication. Study Design/Setting We report a case of a 57-year-old male who underwent a three level C3-C6 anterior cervical discectomy and fusion with instrumentation who developed a postoperative bilateral C5 motor palsy. Methods A review of the literature was performed regarding reports on and incidence of post-operative bilateral C5 palsy following either anterior or posterior cervical spine decompression. Results Bilateral C5 motor palsy is a rare complication of cervical spine decompression with an overall incidence of 0.38%. Although a group of risk factors have been suggested no single cause has been identified. Conclusions Bilateral C5 motor palsy is a rare but debilitating complication of cervical decompression. Postoperative paralysis of the upper extremities due to C5 palsy is a well-documented complication of decompression of the cervical spine. Unilateral C5 palsy is far more common than bilateral C5 palsy and, as such, little discussion has been dedicated to bilateral C5 palsy in the literature. 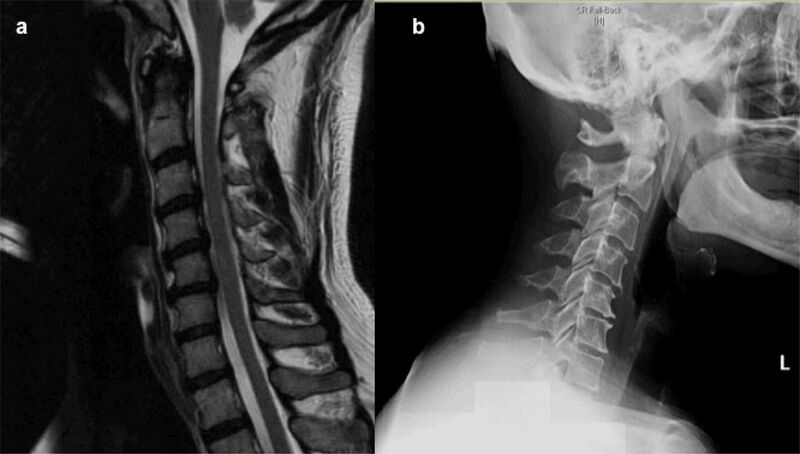 We present a patient who underwent a three level anterior cervical discectomy and fusion (ACDF) for cervical stenosis who developed a postoperative bilateral C5 motor palsy as a starting point for reviewing the current literature on this condition. A 57-year-old right-hand-dominant male construction worker presented complaining of chronic neck pain that had recently progressed to include right arm weakness and right hand numbness. He reported weakness primarily with elbow flexion and shoulder abduction and reported numbness to his right second and third digits. Physical exam was notable for limited neck range of motion due to pain and stiffness, grade 4 strength to the right deltoid and biceps, and decreased sensation to the radial aspect of the volar forearm and second and third digits. The patient had normal biceps, triceps, and patellar reflexes, no difficulty with tandem gait, and had a negative Spurling test. Radiographic examination revealed multilevel degenerative disc disease with extensive osteophyte formation and loss of natural lordosis (Figure 1A). MRI revealed multilevel cervical stenosis with diffuse disc herniations, worst at C3-4, C4-5, and C5-6 (Figure 1B, Figure 2). a) midsaggital T2 weighted MRI demonstrating multilevel stenosis without evidence of cord signal changes and b) lateral radiograph demonstrating multilevel disc disease and loss of natural lordosis. Preoperative T2 MRI images of the cervical spine at a) C3-4, b) C4-5, and c) C5-6 demonstrating multilevel disc disease, spondylosis, and nerve root impingement. The patient was indicated for a C3-4, C4-5, and C5-6 anterior cervical discectomy and instrumented fusion through a single transverse left-sided incision. A standard operative approach was utilized and the posterior longitudinal ligament was taken down. Prophylactic cervical foraminotomies were not performed as per surgeon protocol. Anterior instrumentation was done with a three level Medtronic Atlantis Translational Anterior Cervical Plate (Medtronic, Minneapolis, MN). Fusion was performed via insertion of 8mm, 9mm, and 9mm Medtronic PEEK interbody devices filled with Cornerstone Fibular allograft and ¼ of an extra small rhBMP-2 Infuse sponge at C3-4, C4-5, and C5-6, respectively (Medtronic, Minneapolis, MN). There were no intraoperative complications and neuromonitoring of somatosensory evoked potentials (SSEPs), motor evoked potentials (MEPs) and electromyography (EMGs) remained stable throughout the procedure. Postoperatively the patient was placed on a twenty-four hour intravenous steroid taper to decrease the risk dysphagia and airway edema. Immediately postoperatively the patient was noted to be moving his upper extremities without difficulty. At the four-hour postoperative check the patient was noted to have bilateral grade 4 deltoid and biceps strength. On postoperative day one, approximately eighteen hours after surgery, the patient was noted to have grade 2 bilateral deltoid strength and grade 3 bilateral biceps strength. Sensation was intact to all upper extremity dermatomes. A postoperative MRI obtained to better evaluate the neural structures demonstrated appropriate hardware placement and no signs of acute nerve injury. The patient was diagnosed with a bilateral, pure motor C5 palsy and was placed on a second twenty-four hour intravenous steroid taper. Occupational and physical therapy were consulted for assistance with ambulation and self-care and the patient was discharged home on postoperative day three. The delay in discharge was primarily to initiate therapy and set up appropriate home services given the anticipated needs for a patient with a bilateral upper extremity palsy. The patient’s symptoms persisted for three months postoperatively but were noted to be slowly improving at the six-month visit. At one year follow-up the patient’s symptoms had completely resolved with no residual deficits. Upper extremity paresis due to C5 palsy is a known complication of surgical decompression of the cervical spine. A recent systematic review calculated the average incidence of C5 palsy to be 7.7% and 7.8% for anterior and posterior cervical decompression, respectively.1 Multiple theories for the cause of C5 palsy have been suggested in the literature. These have included intraoperative iatrogenic nerve root injury, the presence of a congenitally narrow C5-foramina, and local postoperative repurfusion nerve root injuries. 1-5 However, it is unknown at this time as to why the C5 nerve root seems to be the most sensitive to these phenomena. The most commonly cited and accepted theory for C5 nerve palsy is the ‘tethering effect’, whereby it is believed that an increase in posterior shift of the thecal sac after decompression of the spinal canal and restoration of anatomic lordosis puts tension on the exiting C5 nerve root and, either by ischemia or neuropraxia, causes injury.1,6–9 This theory is further supported by the equivalent rates of C5 palsy after both anterior and posterior cervical decompression. While the two approaches vary in technique, they both decompress the spinal canal and restore lordosis allowing for posterior shift of the thecal sac and tension on the C5 nerve root. Documented risk factors for development of postoperative C5 palsy include ossification of the posterior longitudinal ligament (OPLL), increased preoperative spinal cord rotational deformity, a narrow C5 foramen, older age, increasing number of levels of decompression, and preoperative myelomalacia.10–13 Although relatively rare, the economic and psychosocial cost of a postoperative C5 palsy is significant. Patients with unilateral postoperative C5 palsy have demonstrated reduced ability for self-care, reduced quality of life, and have incurred increased medical costs due to the need for outpatient physical and occupational therapy.14 Published recovery rates have varied but appear to be dependent on the severity of initial paralysis alone. Approximately 95% of patients with grade 3 muscle strength or greater make a full recovery while only 70% of patients with grade 2 muscle strength or lower recovered to functional status. 15 At this time there is no specific treatment option for C5 palsy that has been shown to improve or accelerate recovery. Although steroid administration and physical therapy directed at maintaining range of motion are the mainstays of treatment, there is no literature to suggest that these modalities improve long-term outcomes. Published incidence of postoperative bilateral C5 palsy. In reviewing the case in question in an attempt to determine the cause for this complication, the only identifiable preoperative risk factor for development of C5 palsy was the plan for a three level surgery. Our patient did not did not have any other risk factors such as OPLL, older age, cord-rotational abnormalities, myelomalacia, or a narrow C5 foramina. It is important to note that rhBMP-2 was used in an off-label fashion as a fusion aide in this case. BMP has been shown to increase fusion rates after multilevel ACDF.18 Conversely, BMP has also been shown to affect oligodendrocyte maturation and myelination, is known penetrate the thecal sac in the presence of a nerve injury, and has been associated with complications in cervical spine surgery such as wound infection and dysphagia.18–21 However, a recent metaanalysis regarding complications of BMP use in cervical spine surgery found no statistically significant relationship between the use of BMP and the development of post-opreative C5 palsy or any other neurologic complication.18 Nonetheless, given the known effects of BMP on nerve cell function, further research into the potential relationship between BMP and postoperative C5-palsy is warranted. The most likely etiology for this instance of bilateral C5 palsy was the aforementioned ‘tethering effect’. Our patient demonstrated a 12-degree increase in cervical lordosis (Figure 3) and a 0.9mm posterior shift of the cord after decompression (Figure 4), suggesting a possible stretch or transient ischemic injury to the bilateral C5 roots. While this does not represent an overly significant increase in restoration of cervical lordosis, given the absence of other risk factors it remains the most logical explanation. Thus it is important to recognize that while adequate decompression can restore cervical height and lordosis, it also has the potential to place the C5 nerve roots at risk for a traction injury. The difficultly then lies in determining who is at risk for nerve root injury and subsequently striking a balance between adequate decompression and protection from a potential traction-related palsy. Effective means for identifying patients at risk for C5 palsy, especially bilateral C5 palsy, have yet to be developed and represent an important future endeavor. a) preoperative and b) post operative lateral cervical spine xrays measuring C3-C7 cervical lordosis angle. 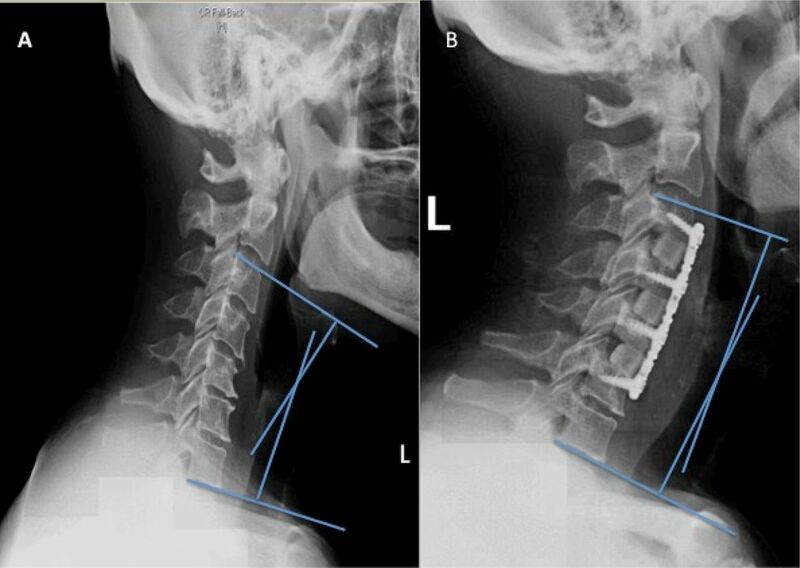 The preoperative angle was measured to be 8 degrees of kyphosis while the postoperative angle was measured to be 4 degrees of lordosis, demonstrating a 12-degree postoperative increase in cervical lordosis. a) preoperative and b) post operative fluid sensitive T2 axial MRI at the C4-5 disc space. Posterior cord shift is measured as the difference between the distance from the ventral border of the cord to the dorsal border of the C4-5 disc. Figure A demonstrates a preoperative distance of 1.9mm while figure B demonstrates a postoperative distance of 2.8mm, thus leading to a 0.9mm increase in postoperative posterior cord shift. Bilateral C5 palsy is a rare although potentially debilitating complication of cervical decompression and fusion. Based on the recent literature the incidence of this complication is 0.37%, representing 8.8% of all postoperative C5 palsy. While the true cause is likely multifactorial, restoration of cervical height and lordosis after decompression can put the C5 nerve roots at risk for a traction-related injury. Patients who suffer from this complication have difficulty with postoperative self-care and activities of daily living and should be identified early on as requiring intensive outpatient therapy. All authors report no relevant financial disclosures or conflicts of interest. (2014) C5 nerve root palsy following decompression of the cervical spine: a systematic evaluation of the literature. Bone Joint J 96-B(7):950–5. (2007) Upper extremity palsy following cervical decompression surgery results from a transient spinal cord lesion. Spine. 32(6):E197–202. (2010) C5 palsy following anterior decompression and spinal fusion for cervical degenerative diseases. Eur Spine J 19(10):1702–10. (2012) The incidence of C5 palsy after multilevel cervical decompression procedures: a review of 750 consecutive cases. Spine 37(3):174–8. (2003) C5 palsy after decompression surgery for cervical myelopathy: review of the literature. Spine 28(21):2447–51. (2003) Relationship of cervical spinal rootlets and the inferior vertebral notch. Clin Orthop Relat Res 409:131–137. (1975) Some aspects of the spinal cord circulation in cervical myelopathy. Neuroradiology 9:209–214. (2009) Spinal cord shift on magnetic resonance imaging at 24 hours after cervical laminoplasty. Spine (Phila Pa 1976) 34:274–279. (1993) Paralysis of the arm after posterior decompression of the cervical spinal cord. I. Anatomical investigation of the mechanism of paralysis. Eur Spine J 2:191–196. (2014) Development of postoperative C5 palsy is associated with wider posterior decompressions: an analysis of 41 patients. Spine J 14(12):2861–7. (2012) The association between preoperative spinal cord rotation and postoperative C5 nerve palsy. J Bone Joint Surg Am. 94(17):1605–9. (2014) Predicting C5 palsy via the use of preoperative anatomic measurements. Spine J 14(9):1895–901. (2012) Multivariate analysis of C-5 palsy incidence after cervical posterior fusion with instrumentation. J Neurosurg Spine. 17(2):103–10. (2014) C5 palsy after posterior cervical decompression and fusion: cost and quality-of-life implications. Spine J 14(12):2854–60. (2006) Bilateral C5 motor paralysis following anterior cervical surgery--a case report. Clin Neurol Neurosurg 108(7):675–81. (2010) C5 palsy after cervical laminoplasty: a multicentre study. J Bone Joint Surg Br. 92(3):393–400. (2014) Complications of spinal fusion with utilization of bone morphogenetic proteIn: a systematic review of the literature. Spine. 39(1):91–101. (2010) Bone morphogenetic protein-2 used in spinal fusion with spinal cord injury penetrates intrathecally and elicits a functional signaling cascade. Spine J 10(1):16–25. (2015) Bone Morphogenetic Proteins: Inhibitors of Myelination in Development and Disease. Vitam Horm. 99:195–222. (2004) Oligodendrocyte maturation is inhibited by bone morphogenetic protein. Mol Cell Neurosci. 26(4):481–92.